Our centrifugal Air Curtains are with high international quality standards. The air curtain maintains environmental separation with a light flow of air, that not only results in lowered energy costs but also helps in preventing air borne contaminants & deterring flying insects from moving from one open space to another-enhancing sanitation & hygiene. Applications Entrance of Industries, Restaurants, Offices, Malls & other commercial places. Cooling Retention Effects:Prevents cold air to go outside & hot air to come inside. Super Sleek Design :Aesthetics that speaks of Slim design & looks apt for any modern environment. Resists Ingress of Dirt & Insects :The even air flow pressure helps in keeping away insects. Velocity Control Feature :Gives full access to control the mode of air curtain depending on door height. Incredible benefits can be achieved by using an air curtain. It controls air transfer, thus saving energy, enhances smooth and faster traffic flow, enhances the usability of spaces near doors and guaranteeing comfort. Moreover, an air curtain gets rid of fog and ice in cold areas and improves safety in places near doors. Inhibits Mosquitoes, Flies and Dust. An air curtain is an energy saving product that is used in commercial and residential buildings to prevent insects, dust and a wide range of other things from entering certain space. Air curtain also ensure that the air in the building remain conditioned while also ensuring that spaces near the doors remain usable. 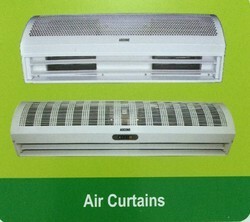 It is available in two main types: circulating and non-circulating air curtains. Air enters the air curtain through the fan housing before being accelerated by the fan. This fast-moving air gets into the plenum which ensures that the air is evenly distributed the entire length of the discharge nozzle. The aerofoil design of Blower with vortex shaped housing in combination with the nozzle ensure the uniformity of the airstream and a minimum turbulence. The air which is discharged via the nozzle goes to the floor as a jet stream and about 80 percent of this gets to the side where the air curtain is installed while 20 percent flows towards the opposite direction. Air Curtains comes with high quality international standards - CE GS Approved Casing made in Metal body with powder coating, which is sealed to resist dust going inside, with fire and corrosion resistance, and easy for cleaning and maintenance. The most Sleekest Air Curtain in the World. Single Switch Button to control the High/Low Speed that can meet the need of various environments & door heights. Multiple Installation Specifications-Body dimensions of 3/4/5 Feet. Variable Installation Heights 8-10 Feet. Centrifugal Type Forward - Bending blade Wheel construction, fitted with efficient Volute design, rendering the capacity of the curtain for the best result. This type of wheel is high efficient, less noisy, with large air volume (maximum air speed reaching 21 m/s). High velocity of this air curtain is unmatched by any other air curtain in the market. Over Heating Protection - When motors temperature goes over the temperature (145°C) the power supply will be automatically cut off and when the motors temperature decline (below 145°C) it will start running automatically. 900 mm Air Curtain - 1 Single Bearing & 1 Double Bearing Motor & 3 Blowers. 1200 mm Air Curtain - 2 Double Bearing Motors & 4 Blowers. 1500 mm Air Curtain - 1 Single Bearing & 2 Double Bearing Motors & 5 Blowers. The air curtains such as cold storage air curtains create an invisible barrier of high velocity air which provides complete protection against insects, dust, dirt and fumes from infiltrating food facilities and other clean work areas when the doors are open and these are designed for compactness and rigid. 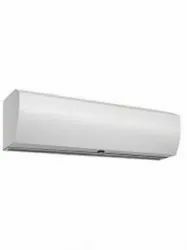 Product Description :Ultramind Air Curtains comes with high quality international standards - Approved Casing made in Metal body with powder coating, which is sealed to resist dust going inside, with fire and corrosion resistance, and easy for cleaning and maintenance. Blowers are made of high quality ABS to ensure less noise with toughness intensified High quality motor, low noise, overload protection, and long life-span. Air speed is with High and Low two switch of speeds. Product Description :Powder Coated Air Curtains have powder coating at the outer surface to give clean and shining look. They have functionality similar to other Air Curtain products. Powder Coated Air Curtain is a modern device which, when installed on a door, forms an invisible curtain of continuous air and thus prevents escape of conditioned air as well as entry of outside hot, humid and polluted air. Powder coated air curtain not only cuts down your electricity bill, but also helps in maintaining cleanliness and hygiene up to the required standard. Thus, using a powder coated air curtain is best suitable way to cut down your electricity bill. Product Description :Air Curtain is a modern device which, when installed on a door, forms an invisible curtain of continuous air and thus prevents escape of conditioned air as well as entry of outside hot, humid and polluted air. It thus not only cuts down your electricity bill, but also helps in maintaining cleanliness and hygiene up to the required standard. 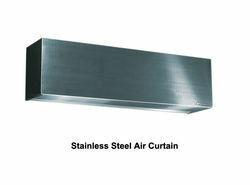 Stainless Steel Air Curtains have Stainless Steel Body. It has added advantage of durability in all weathers, specially the humid weather conditions. The Stainless Steel body is resistant to rusting and other decays and hence have the durability.